J.A. Souders was born in the heartland with an overactive imagination and an over abundance of curiosity that was always getting her into trouble. 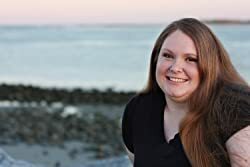 She first began writing at the age of 13, when she moved to Florida and not only befriended the monsters under the bed, but created worlds for them to play together. Because she never grew up, she decided she’d put her imaginary friends to work and started writing. She still lives in the land of sunshine and palm trees with her husband and their two children and is an active member of the RWA, CFRW, YARWA and SCBWI. Learn more at J.A. Souder’s website. Click here for more stories by J.A. Souders. The Elysium Chronicles — (2012-2016) Publisher: Since the age of three, sixteen-year-old Evelyn Winters has trained to be Daughter of the People in the underwater utopia known as Elysium. Selected from hundreds of children for her ideal genes, all her life she’s believed that everything is perfect. Her world. Her people. The Law. But when Gavin Hunter, a Surface Dweller, accidentally stumbles into Elysium’s secluded little world, Evelyn comes to a startling realization: Everything she knows is a lie. Her memories have been altered. Her mind and body aren’t under her own control. And the person she knows as Mother is a monster. Together with Gavin she plans her escape, only to learn that her own mind is a ticking time bomb… and Mother has one last secret that will destroy them all. Tolstoy wrote “Happy families are all alike; every unhappy family is unhappy in its own way.” I find that with dystopian literature, every unhappy society is alike. There is a good argument to be made that modern literature has two main strands of dystopian literature, what we could refer to as the Orwellian strand and the Huxley strand, and YA dyslit follows that same trend. Renegade falls into the Orwellian/HUNGER GAMES camp with an authoritarian central government that controls every aspect of the citizens’ lives. For those who read political philosophy, there are definite echoes of Plato’s Republic echoing through this story, as could probably be said of much dystopian literature.